Since the Huracan EVO Coupe was announced, people have been awaiting the announcement of the Huracan EVO Spyder. It turns out they didn’t have to wait long. The Huracan EVO Spyder has been announced, and we have all the important specs and performance information. What’s more, if you would like to order a new Lamborghini Huracan EVO Spyder in Austin, TX, then you have come to the right place. Either stop in and see your friends at Lamborghini Austin or click the link at the bottom of this page to request more information. We would be happy to do everything in our power to get you behind the wheel of a Huracan EVO Spyder soon. If you want to see what new Lamborghini models we currently have in our showroom, then click the link below. Otherwise, keep reading to learn more about this convertible Italian performance machine. 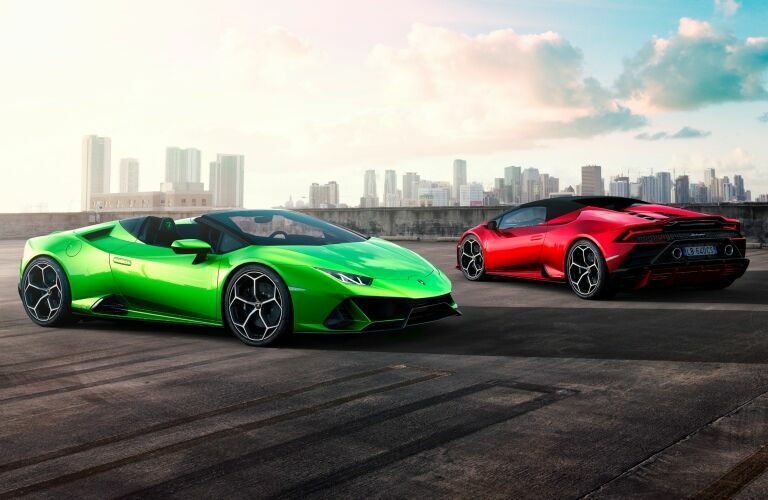 The Huracan EVO Spyder will get the same Performante engine that the EVO coupe gets to enjoy. That means it will have a V10 with 640 horsepower and 443 pound-feet of torque. It also gets to enjoy standard all-wheel drive along with all-wheel steering. That all-wheel steering means the Huracan EVO Spyder will not only be more maneuverable in tight spaces, but it will also be more stable at high speeds. 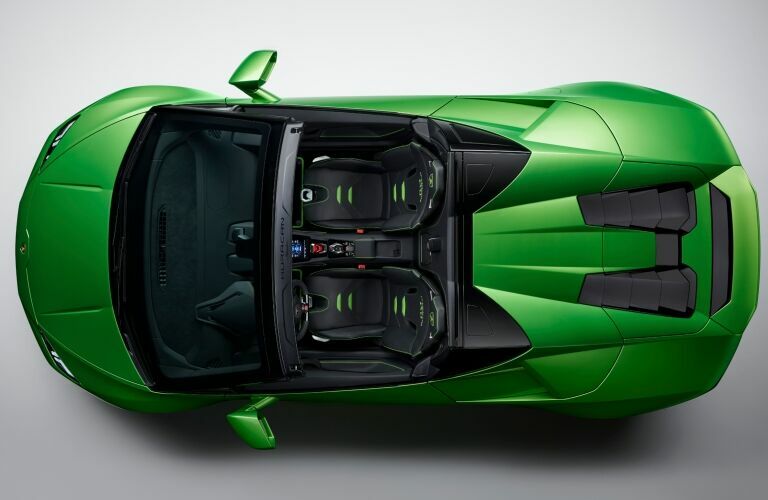 Because the Huracan EVO Spyder lacks a roof, it has to make up for that structurally. That’s why, perhaps counterintuitively, the Huracan EVO Spyder weighs a little more than the EVO Coupe. The Coupe has a dry weight of 3,134 pounds and the Spyder has a dry weight of 3,400 pounds. It’s this weight difference that leads to slight differences in the overall performance of the Spyder. The Huracan EVO Spyder can boast of a ridiculous 202-mph top speed, and it will get there lightning fast too with a 0-62 mph (0-100 km/h) time of 3.1 seconds and a 0-124 mph (0-200 km/h) time of 9.3 seconds. 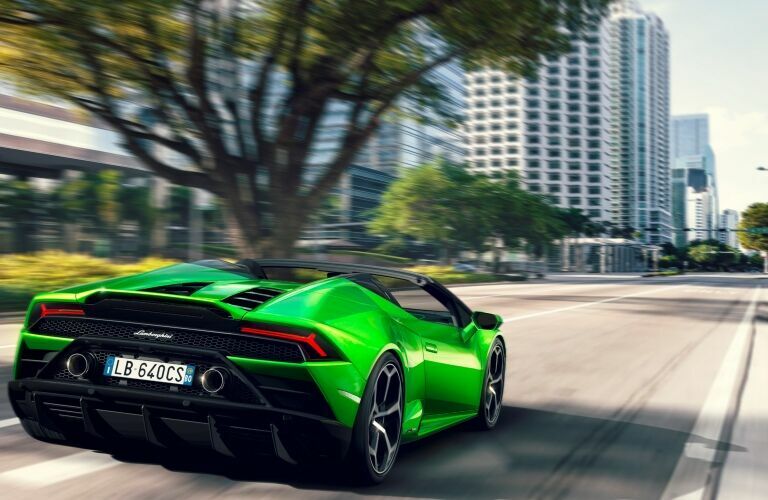 Not only will the Huracan EVO Spyder have the performance you want, but it also comes loaded with tech. Some of its technology includes integrated vehicle dynamics, a dual clutch 7-speed transmission, magnetorheological shock absorbers, and even a human-machine interface that provides standard infotainment features along with real-time telemetry all at the touch of your fingers. To start the ordering process, you can click the link below and request more information. Otherwise, you can always feel free to stop by Lamborghini Austin. We hope to see you soon, and we can’t wait to turn your Lamborghini dreams into reality.